In the collision of neutron stars, the extremely compact remnants of evolved and collapsed stars, two light stars merge to one massive star. The newly-born heavyweight vibrates, sending out characteristic waves in space-time. Model calculations at the Max Planck Institute for Astrophysics now show how such signals can be used to determine the size of neutron stars and how we can learn more about the interior of these exotic objects. Fig. 1: Various snapshots of the collision of two neutron stars initially revolving around each other. The sequence simulated by the computer covers only 0.03 seconds. The two stars orbit each other counterclockwise (top left) and quickly come closer (top right). Finally they collide (centre left), merge (centre right), and form a dense, superheavy neutron star (bottom). 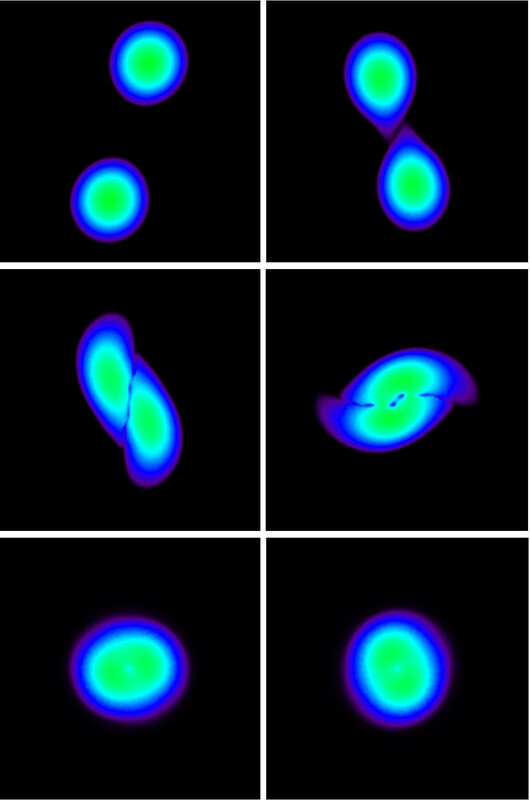 Strong vibrations of the collision remnant are noticeable as deformations in east-west direction and in north-south direction (bottom panels). Fig. 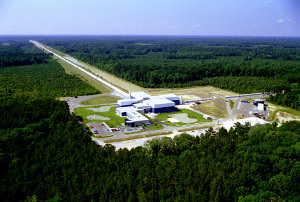 2: Aerial view of the LIGO gravitational-wave detector at Livingston, U.S.A.; the two monitoring arms containing strong laser beams extend to a length of 4 km. Fig. 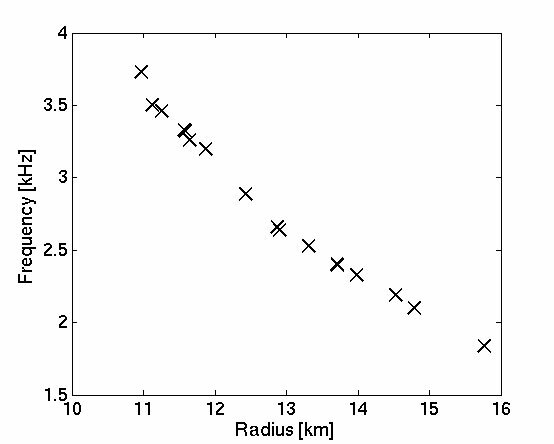 3: Relation between the pitch (frequency) of gravitational waves and the neutron-star radius. The pitch covers one octave. Measuring the pitch with a gravitational-wave detector (Fig. 2) allows determining the radius of neutron stars. From the sound of church bells, anyone can determine - even from miles away - if the chimes come from a mighty cathedral or a small chapel. Even without actually seeing the bell, one can distinguish between a small bell, which produces a high tone, and a large, heavy bell with a deep rumble. And even when the bells have the same weight, their shape and material influence the pitch. Scientists from the Max Planck Institute for Astrophysics have now found a similar relationship between size and pitch for distant neutron stars. And, like church bells, the researchers want to use the pitch to determine the radii and the composition of neutron stars. Striking a bell excites sound waves in the air; neutron star oscillations lead to ripples in space-time that propagate with the speed of light away from the source. These gravitational waves have been predicted by Einstein in his general theory of relativity, and scientists hope that they will be able to "hear" the tiny vibrations of space-time in the coming years with the help of highly sophisticated experiments (Fig. 2). But how do you get a neutron star to start vibrating? Above all, the researchers need patience. Many neutron stars occur in binary systems where they orbit each other, slowly getting closer over the course of several 100 million years. Finally, the two stars with diameters of a few ten kilometres collide and form a single star that is much heavier (see Fig. 1). The collision excites strong oscillations in the newly formed neutron star and leads to the emission of measurable gravitational waves. According to predictions, there should be a large number of such binary star systems in neighbouring galaxies to our Milky Way. Therefore, chances are not bad to witness such a merger in the future. The latest generation of gravitational wave detectors will be able to monitor thousands of galaxies at the same time. If a collision occurs every 10,000 to 100,000 years in each galaxy (as is expected), the super-sensitive detectors will not miss it. With computer simulations, the scientists at MPA studied how the pitch of the emitted gravitational waves depends on the size of the neutron stars. The star diameter depends on the internal structure and properties of the neutron-star matter. Since the latter are not well known, the researchers used many different suggestions for neutron-star matter in their calculations and determined the corresponding "sound" of the collision. The pitch varies between the tones b´´´ and b´´´´. As expected, smaller stars produce higher tones, while more extended objects produce a lower tone (see Fig. 3). The simulations of the scientists thus open up the fantastic possibility to accurately measure the size (to within a few 100 metres) of an object that is many million light-years away from Earth. The new results are particularly exciting, because neutron stars are very extreme objects. With diameters of 20 to 30 kilometers, their mass of 1.5 to 2 times the solar mass is compressed to densities exceeding those in atomic nuclei. Such conditions cannot be created and studied in any laboratory on Earth. Nevertheless, matter at such high densities is of particular interest for many researchers. In such an extreme environment, fundamental processes of nuclear and particle physics emerge, such as interactions between elementary particles, and determine the properties of neutron-star matter. The observation of signals from distant astronomical objects therefore allows a deeper insight into the most fundamental building blocks of nature.